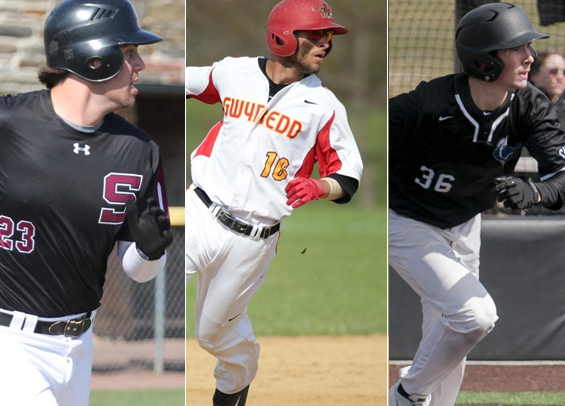 As conference play for most clubs is in full swing, now is an excellent time to take a look at some of the region's top performers through the first portion of the D-III college baseball season. Catcher: Dylan Towey leads Arcadia with 18 RBIs on the season and a .534 slugging percentage. He's hitting .362 in 16 contests. Infield: Cole Beeker is leading the Garnet in RBIs (24), OPS (1.252), and slugging (.676). Infield: Joe Aurite leads the Cavs in RBIs (18), slugging percentage (.508), and OPS (.919). He's also committed just two errors in 95 chances and turned 14 double plays. Infield: Dave Tatoian is hitting .414 for Gwynedd Mercy with 14 RBIs. Infield: Stephen DeBellis leads Widener with four homers to go along with 17 RBIs. He's hitting .377 through 20 games. Outfield: Holden Bridge is putting together an outstanding campaign, hitting .469 over 15 games for Swarthmore. He's also driven in 16 runs. Outfield: Charles Levitt is one of the region's top offensive threats, hitting .441 for Swarthmore with 16 RBIs. Outfield: Jared Gillen is second on the Garnet in RBI production (20) and leads the team in total bases (45). He's hitting .394 on the season. Outfield: Mack McKisson entered the season with big expectations and so far he's delivered, hitting .363 for an upstart Cabrini team that's 15-4 overall and undefeated in conference play. Outfield: Jason Mulvey leads Gwynedd Mercy with 34 total bases and a .567 slugging percentage. Designated Hitter: Bryan Gillen is killing the ball for Arcadia, hitting .452 on the season to go along with a 1.070 OPS and 14 RBIs. We'll announce the top performing pitchers next week.